Young adults from 36 states of the USA, from six provinces of Canada, from Mexico, around 15 from Haiti and a small group from Europe came together in Chicago from 25 to 28 May for a new stage in the pilgrimage of trust on earth. Previous to the meeting, three of the brothers of the community had spent three months in the city. Their presence was essentially gratuitous, consisting in contacts, visiting groups and parishes, in all the diversity of this great metropolis, and with visits to young adults in other regions of the United States and Canada. The first to arrive was a group of 47 young people from South Dakota. Many of them were Native Americans. 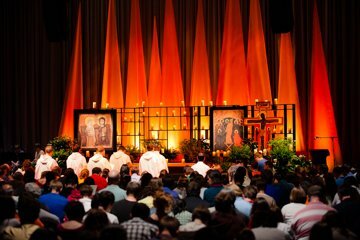 Taizé is not unknown to them since several of them visited Taizé last year. Soon they were joined by Lutherans, Methodists, Episcopalians and Catholics from Nebraska, California, New Mexico, New Jersey and over 20 from the region of Ottawa…. DePaul at Chicago, the largest Catholic university in the United States, spared no effort to welcome all the participants, transforming for three days its famous sports centre into a place for prayer. A carpet covering the surface of the gymnasium enabled all the young people to sit on the floor. Large icons of the Friendship of Christ, the Resurrection, and the Cross held people’s attention. The prayer around the Cross was a discovery for many. Each evening it lasted for a long time. The singing continued in English, Spanish (nearly half the Catholics in Chicago are Spanish speaking), Polish, and a song in Lakota, the language of the Native Americans who were present. All the young people were accommodated in catholic and protestant parishes of Chicago. Welcomed in families, they were able to share with their host families at breakfast and in the evening. On the Saturday afternoon, workshops provided an opportunity for some to reflect on questions about the spiritual life while others concentrated on challenges in society such as welcoming refugees or the homeless; a team of doctors and social workers takes care of these. DePaul bears the name of a great French saint: “Saint Vincent de Paul”. For several years the university has been trying to develop a sense of service among the students. The expression “a sense of service” is frequently repeated. This year, 1800 of them have taken part in a day of service. The person mainly responsible for this initiative led a workshop on the inventiveness of love. In another room, other young adults came together to reflect on the life of faith as a call to think and to create. “Where would you like to see more creativity today?” Education, politics, economy, art, music, social relations; all of these areas were named. Each person expressed their preoccupation and their desire to take part in an effort of renewal. A young professor in a well known college explained: “We must not confuse critical thinking with cynicism.” What was striking was the age of the participants. These were not adolescents but young adults, most of whom are between 21 and 35. Several of them already had an experience of professional life. They were at the one time critical and hopeful. And the question which they were invited to discuss concerned hope that “broadens” our capacity to reflect and increases our sense of what is possible. An article in The Washington Post on the pilgrimage of trust in Chicago underlined the sense of the Church that young people discover in these meetings. Several church leaders, both protestant and catholic, among them Cardinal George, Archbishop of Chicago, the Moderator of the Presbyterians and the Methodist bishop took part in the prayer on the Saturday evening. Each evening, the meditations of Brother Alois were like a call not to listen to our fears, but to dare to commit ourselves in the footsteps of Christ. The meeting coincided with the Feast of Pentecost. Chicago is known as the "windy city." A breeze of a different kind has just passed over it.